Pope of the poor, fight for us. We are Filipino migrants, immigrants, refugees from all over the world who, together with our families, call upon Your Eminence, to bear witness to our struggle. We call on you to speak in behalf of overseas Filipinos in our quest for a better life. We have experienced first-hand human and labor rights abuses and exploitation. Hear our stories and join us in our fight against modern-day slavery. Of present, an estimated 15 million overseas Filipinos are found in over 230 countries. Massive unempoyment, landlessness, poverty and globalization have been forcing our countrymen to migrate. There exists a widespread desolation, hopelessness and desperation that have caused the Filipino people’s diaspora. Pope of the poor, fight for us. In your tenet to build “A Church without frontiers, mother to all”, we likewise reach out to you with open arms and hearts for our common objective to open the doors of Your Church worldwide in the spirit of genuine service to the people. Like you, we stand firm that forced migration is an anomaly and a matter of deep concern involving the lives and dignity of our migrant workers. Ours is now an era of modern-day slavery wherein our migrant workers and their families are subjected to most cruel conditions in favor of greed for remittances and the desecration of human rights. Pope of the poor, fight for us. We have seen the absence of legal frameworks that genuinely promote and protect the rights and welfare of our OFWs and their families. We have dissected and evaluated the efficiency or lack thereof of existing government programs and discussed ways to bring these to the concern of our authorities. We realize that the Philippines has many policies and laws on migration that need to be translated into concrete action. We have seen that the continuation and intensification of the government’s labor export policy would only add more to the sufferings of our people, making them more vulnerable to human and labor rights abuses. We ask of you to speak out against this policy. We need to address the fundamental conditions of our society, especially the unequal distribution of wealth and work among nations which drives our people to forced migration. Pope of the poor, fight for us. We agree with you that human trafficking is indeed “a crime against humanity”. It is a violation of our fundamental rights. It breeds the evils of discrimination, criminalization of undocumented migrants and all forms of violence, oppression and enslavement. We are also greatly disturbed and moved by the tragedy of the separation of families. We cry for the sufferings and pains of children left behind and growing up without proper guidance, parents and couples estranged from each other, and the resulting economic, emotional and psychological implications of loved ones being uprooted from their families. We call on you to work hand in hand with migrants’ organizations and advocates in support of the plight of our Filipino migrants. There are still many things that need to be done. Pope of the poor, fight for us. We call on Your Eminence, that through Your Office, you can help us in organizing and broadening our reach and making our voices resound. There is a dire need to consolidate our efforts in various parts of the world. Together, let us face the challenge of holding the cause of Filipino migrants and their families. 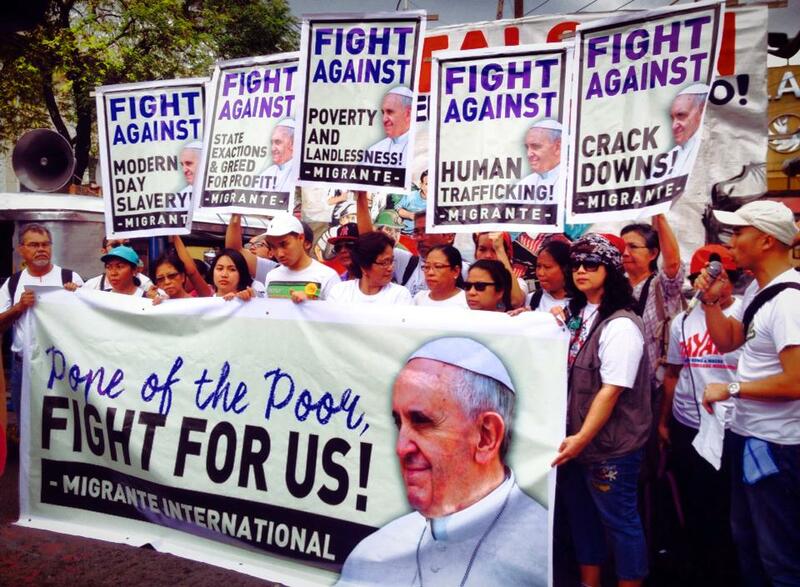 This entry was posted in Statements and tagged Filipino migrants, labor rights abuses, Pope. Bookmark the permalink.